From a wholesaler that supplied goods for department stores under their brand names, Blažek has developed into a company with its own retail network and a strong brand. AT THE END of the eighties, Ladislav Blažek studied engineering at the Czech Institute of Technology in Prague. While a student he worked at Krátký film (Short Film) and took part in the creation of the “Trade Fair Seconds“ news. He was struck by the sharp contrast between how domestic and foreign engineer trade fair visitors dressed in the late eighties. “Gray lingered on – nearly all our managers and technicians were poorly dressed,“ he recalls. And thus the engineer went into fashion. “Fashion changes faster than any other field, we have two collections a year, so every six months there are new materials and new designs,“ he says, explaining why he chose fashion. The firm’s very beginning dates back to 1992. “There was no culture of clothing here, it was the so-called ‘era of white socks’,“ jokes Blažek. So the firm concentrated on men’s fashion, where the situation was worse than in women’s fashion, there was less market competition, and the middle and upper-middle categories weren’t under siege from Asia. It was a long road from the decision to enter the fashion business to the creation of the first products. Blažek wanted to use high-quality materials for his products, so he took his designer to the Paris wool trade fair, where he met with fabric suppliers. This turned out to be one of the hardest tasks, as he had to first gain and then build on their trust. Trying to use high quality makes sense: “People buy suits to look good, and the quality of the fabrics dramatically affects the results, how the clothes feel when worn, and what they radiate. One-hundred-percent wool from Italy has a certain fluidity that is simply essential,“ Blažek explains. Hiring good designers was also crucial. “We have a studio in Moravia, where the garment industry had and still has a greater tradition than in Bohemia,“ he says. At first they worked with freelance designers, whom he convinced to work for a little-known firm by sharing the simple strategy he wanted the firm to follow and what the collection’s market position should be. He allowed them freedom within these parameters. “It was and remains attractive for designers. Today we regularly receive offers and CVs from Czech and foreign designers,“ he adds. The firm’s own designs then went to specialized firms that manufactured the collections. This is the most efficient method, and Blažek, like many of his peers, uses it to this day. All the parts of the fashion collections are made in central and eastern European factories from materials supplied by renowned western European producers. 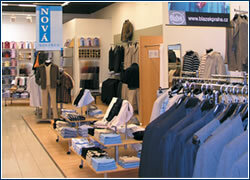 At first the firm made garments under its customers’ brands, for K-Mart and Kotva, among others. In 1994 the firm started building its own Blažek brand and logo, which the founder sees as one of the key milestones in the firm’s development. “We could have used many names, but we finally decided to use my name.“ At first it seemed unusual to many people, particularly in Bohemia, where fashion firms customarily used brands with various Italian names. 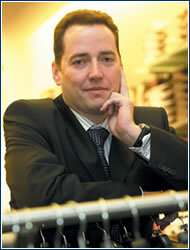 “Later, during negotiations with foreign suppliers, for instance, I realized that it was a great decision,“ Blažek says. An entrepreneur who gives his own name to his firm demonstrates that he’s serious about his business, and sends a very important signal – not only to foreign suppliers, but mainly to customers. Even after the birth of the Blažek brand, the products were sold through fashion boutiques, but at the end of the nineties the firm decided to build its own retail network, which allowed it complete control over how its products were sold. Another reason for building its own shops was the problem with its customers’ paying habits. The situation worsened during the crisis in 1997 and 1998. 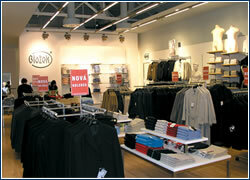 So in 2000 the company opened its first brand outlet in the Zlín shopping center. “The decision to build our own network was one of our most important, since without that our brand wouldn’t be as well known today and our collections wouldn’t be as extensive.“ Thanks to the shops, the firm is in direct contact with its customers, whose tastes influence production planning and the creation of upcoming collections. Recently the connection of individual shops with headquarters through secured data lines was completed, so the company receives real-time information on ongoing sales and can quickly react. This year Blažek expects sales of around CZK 185 million. 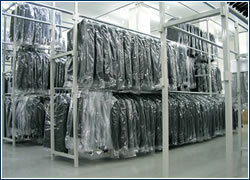 The current warehouse is about two-thirds men’s fashion, and the rest is so-called corporate clothing. For example, Blažek’s firm designs and manufactures clothes for Česká pošta managers (women as well as men), dresses Coca-Cola sales representatives, and tuxedo tails for members of the National Theater Philharmonic Orchestra. Two-thirds of the non-corporate production is sold in the company’s shops, and the rest goes to independent vendors. In December 2004 the company opened its tenth shop, in the Letňany shopping center, and in the next two to three years Blažek plans on opening another ten shops. 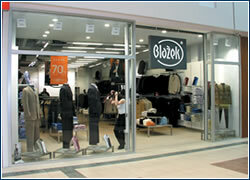 Blažek brand men’s clothing also can be purchased outside of the company’s own retail network. In the days when the firm had no shops, negotiations with vendors about how Blažek brand products should be sold were very complicated, but thanks to its retail network the process is much simpler. “We just show them our shops,“ Blažek says. 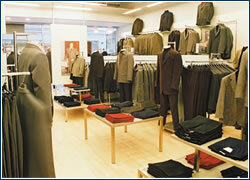 The retail chain makes it possible for the owner’s vision to come true. “Our ambition is to have a complete offer, from socks to tie, under our brand.“ Today’s collection includes about 300 items. 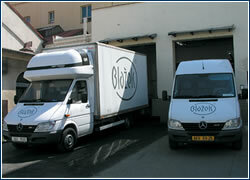 But there’s more involved than just the product, there are also associated services. Locating the outlets in shopping centers allows for many pleasant options, such as giving customers something to do while waiting 30 minutes for an alteration. “Retail’s beauty is that if you take it seriously you can do a lot for your customers,“ Blažek concludes. Financing was one of the firm’s initial problems, because the suppliers required secured payments from their export insurers, but they were unwilling to insure trade with an unknown firm, so the only way to ensure delivery was by advance payment. Then factoring became available. A factoring firm headquartered in Prague was willing to take a chance on the unknown Czech firm. The first revolving loan with a bank in 1994 further simplified the situation. But it wasn’t over yet, because the bank’s privatization led to administrative problems, and the account was opened two months late. “That was one of the worst and hardest moments in my business, as we needed to finance production for the autumn/winter season,“ Ladislav Blažek recalls.